Happy Birthday. . HD Wallpaper and background images in the Sonic, Shadow, and Silver club. 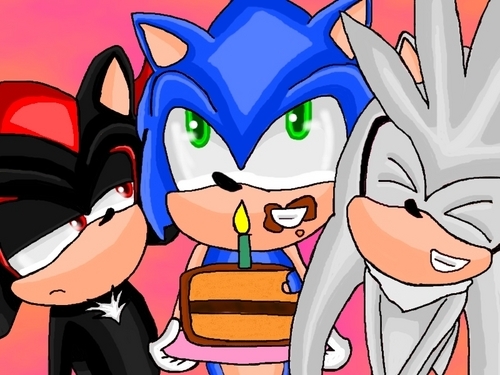 This Sonic, Shadow, and Silver fan art might contain मोबाइल फोनों के लिए, हास्य पुस्तक, मंगा, कार्टून, एनीमे, कॉमिक बुक, and manga. Shadow, just take him to the bathroom. OMG!!! SONIC AND MICHAEL JACKSON!!! Could someone buy him icecream already? WTH IS WRONG WITH YOU, SHADOW??? What they were ACTUALLY thinking! WHERE'S THAT DAMN 4TH CHAOS EMERALD???!! !